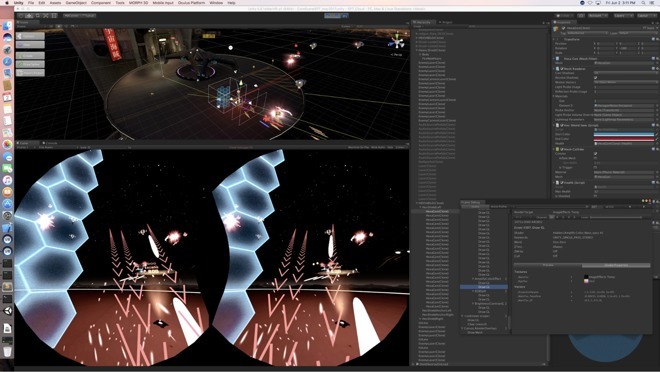 Game development engine producers Unity has strongly recommended to its users to avoid the upgrade to macOS 10.13 for the moment, as despite the firm fixing a number of issues that plagued developers using the tool with High Sierra's beta releases, there are still some faults that need to be rectified to make the game engine stable on Apple's latest operating system —and APFS is inducing problems in other game titles as well. The iPhone Team Lead for Unity Technologies Mantas Puida advises on the company forum that its High Sierra upgrade recommendation is "better postpone it." A previous version of the post advises that there were "some issues" with the beta 1 release of macOS 10.13, which also advised holding off on upgrading until issues were fixed. One major issue raised during the beta releases was of disappearing assets in Project View, which was found to be an interoperability problem between Unity and APFS, Apple's new file system. While patches for releases 5.5.4, 5.6.3, 2017.1.1 and 2017.2.0 RC 1 and later do fix the disappearing asset bug, Unity confirms there will not be any fixes to version 5.4.x for High Sierra, and that affected users will either have to upgrade their project to Unity 5.5.x and later or keep using macOS 10.12. During the High Sierra betas, a number of forum posters found they could still use Unity by installing the tool and project files onto a secondary drive formatted as Mac OS Extended (HFS Plus), though it did not work for everyone. While Unity has largely solved that problem, the firm advises there are still some High Sierra-related bugs that need squashing. Users are unable to use Local Cache Server in Unity, as this will crash the whole operating system, with the current solution being to disable it for the moment, though the remote version is said to "work fine." Monodevelop, a customized version of an open source development environment that ships with Unity, was reported by users to crash at startup when in High Sierra, an issue that has also been fixed in Unity patches. Another Monodevelop issue, where the software crashes when it is dragged between monitors, has yet to be solved. Puida does offer some general advise relating to testing beta operating systems, suggesting "Please consider installing it to a separate partition to not interrupt your everyday workflow." The same advice could be extended to newer versions of operating systems and software as a whole, especially when used in mission critical or production systems. Issues with game engines and operating system updates are usually felt not only by developers but also by players. Reports from players of "Cities: Skylines" on Reddit, Steam, and in the AppleInsider forum mention problems with the Unity-based game, including glitches and freezes that appeared both during the High Sierra betas and after the public release. A post on publisher Paradox Interactive's forum answering macOS user complaints about the game acknowledges the issues, advising it is being investigated. Current speculation indicates it is either an issue with Unity, linked to the existing High Sierra APFS problems, or a driver issue. Firaxis and Aspyr title "Civilization V" is having issues with High Sierra APFS compatibility as well. The title, regardless of where purchased, either fails to launch or is crash-prone on APFS volumes. Some users have reported running the title from a HFS+ volume fixes the problem, with others getting no relief. Numerous posts on the Steam forums raise concerns about games using Valve's Source engine, with reduced performance reported in titles including "Team Fortress 2," "Half-Life 2," and "Counter-Strike: Global Offensive." Aside from frame rate issues, some users also find that the Steam client itself is problematic following the move to High Sierra, with clients reporting they are not up to date, despite the user running the latest release of the software. AppleInsider will continue to monitor this situation, and other compatibility issues that have been generated with APFS, and update accordingly.